Vegans and hummus go hand in hand. More frequently than not, it’s our saviour. Well.. mine anyway. It’s like a safe food. 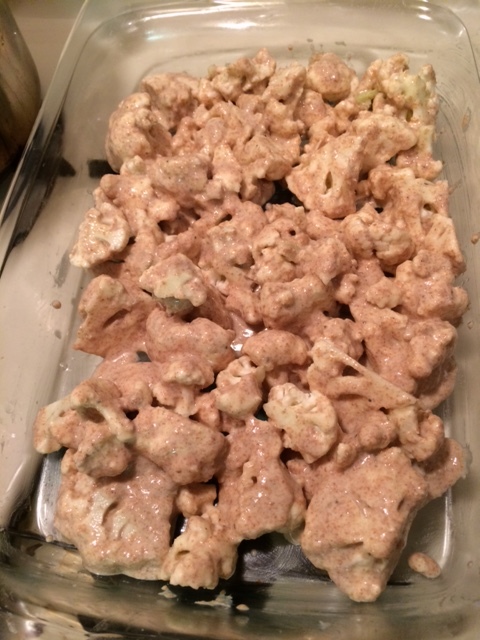 Non-vegans generally adore it and so will offer it as a snack at parties. Many restaurants will carry it, especially the Mediterranean ones and for sure.. a falalfa place is always nearby. In New york at least! Hummu s goes well with breads, crackers, crisps as well as carrots, celery, peppers and other raw vegetables. I’m starting to see snack pack sizes of hummus in the grocery stores- that’s a positive move for kids and people on the go. On the flip side, it’s actually really easy to make it yourself. I have blogged hummus many times; I even thought I specifically blogged “sprouted chick pea hummus” but I guess I didn’t. I’m gearing up to go raw vegan (join me) for a little while, since the weather is finally breaking into consectutive days of sunshine and warmth here in New York. I soak the chick peas overnight and then d rain and rinse them. Let them sit until you see the sprouts coming out. Usually within one or two days (even three). It’s good to rinse them and move them around to shake the water off. Now I have a live food full of enzymes. I put in my tahini and extra virgin olive oil; at least two big tablespoons of both. Taste test as you go! 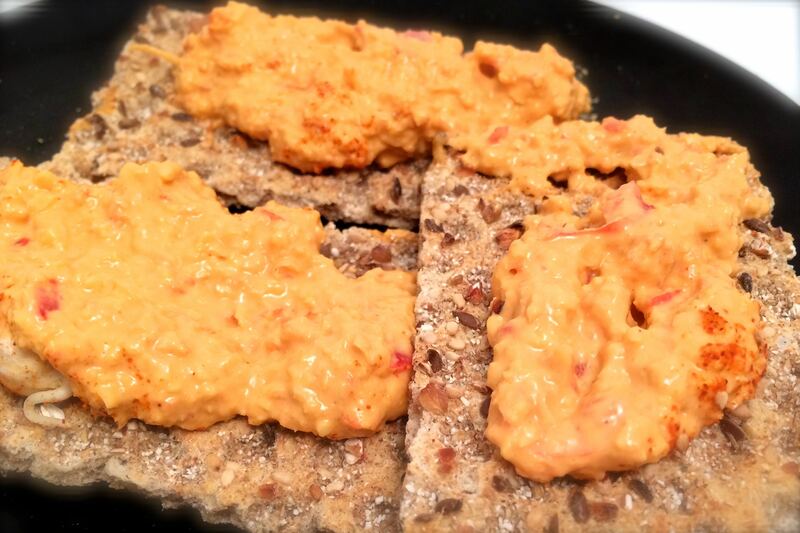 Hot sauce; the title should really be Sprouted Chick Pea – Red Pepper Hummus; the Spicy Version! I’m beginning to think I’m obsessed with lasagna but in reality it’s something I only eat around the holidays. I did however make a few perfect lasagnas back to back and they truly need to be documented- first for my friends and second so I don’t forget! If one were to go through my blog, they would find so many lasagnas. One day it’s about raw lasagna, the next without pasta and then just trial & error. 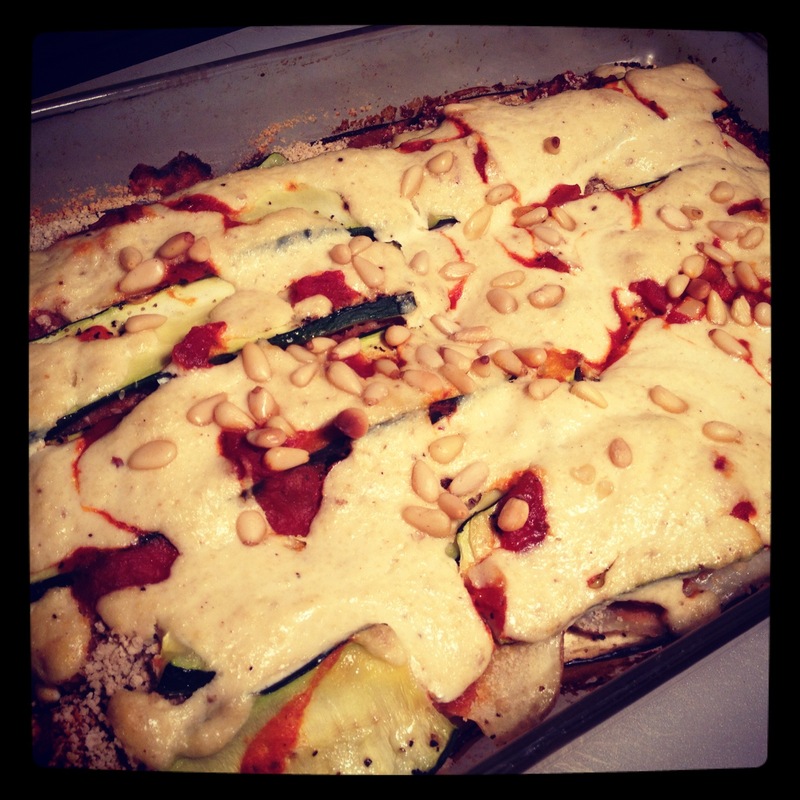 Today’s blog is just simply… “perfect vegan lasagna”. I nailed it! Yes, I can take joy in that – if you only knew the number of experiments. I’m a virgo perfectionist and a diehard Italian pastaholic – don’t forget that. 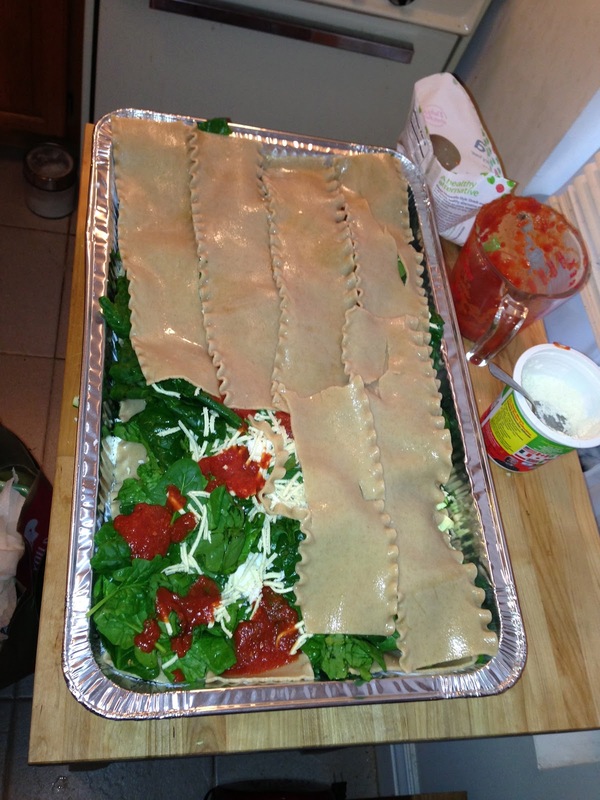 First things first, they may revoke my Italian status here, but I used “oven ready” whole wheat lasagna noodles. I have never done this before. This time my focus was in the filling and hoping it wouldn’t melt away into vegan watery vegetable land nor burn in it’s attempt to make a sweet potato perfectly soft. Did I say sweet potato? Yes I did. 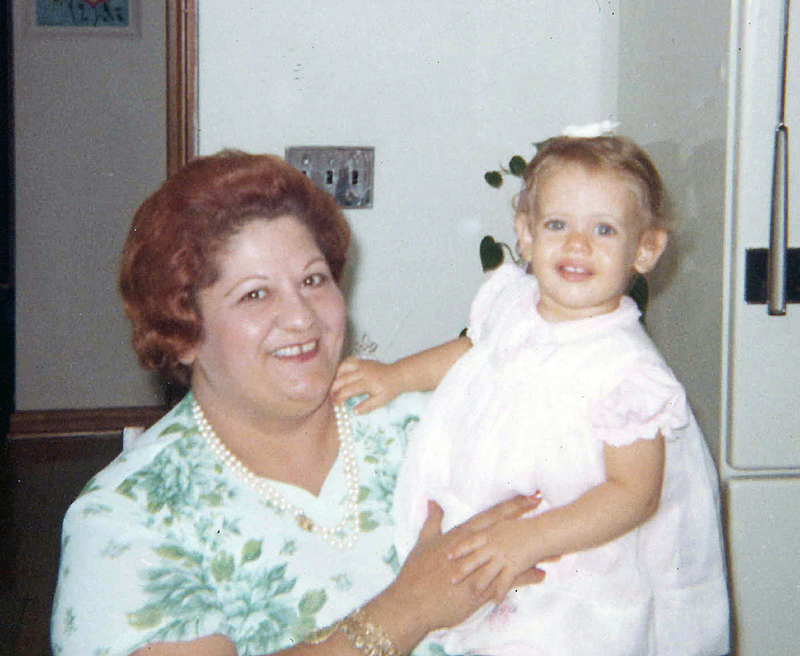 Hey my Grandmother, may she rest in peace, was the best pasta/ best sauce maker and best baker that I know of. Sorry Mom and sorry to my brother Rob – they both fight for title every holiday and I’m not even allowed in because mine is “special”. Anyway, my Grama.. she always tossed a pinch of sugar in there. Luckily, GMOs weren’t around back then! The sweet potato is my way of adding in some sweetness, healthy fiber and a vegetable that won’t disintegrate like a zucchini I once knew. My Grama! This blog is for you- I bet anything you would have made me special vegan Italian food if I asked! RIP.. years ago due to diabetes related causes. And yes.. that’s me! I wanted to add my meat too. I know.. one day I hate the word and the next it’s mine to empower. Whatever.. I wanted my vegan meat layer and I used soy crumbles and mushrooms to get it. My sauce of course is always on point; thanks Grama! Next up.. Daiya cheese. Again.. to cheese or not to cheese and then to call it cheese or not to call it cheese. I’m in a simplistic mood right now so vegan cheese it is and the best melted vegan cheese out there hands down and slammed shut. Mozzarella shredded style to be exact. Be careful not to use too much like me or you will be swimming in lasagna fondue. Spinach – talk about disintegrating. I don’t use frozen; I use fresh and a lot of it due to shrinkage. A lot- get a few bags or bunches. I outed myself again by saying bags. This is a shortcut perfect lasagna. 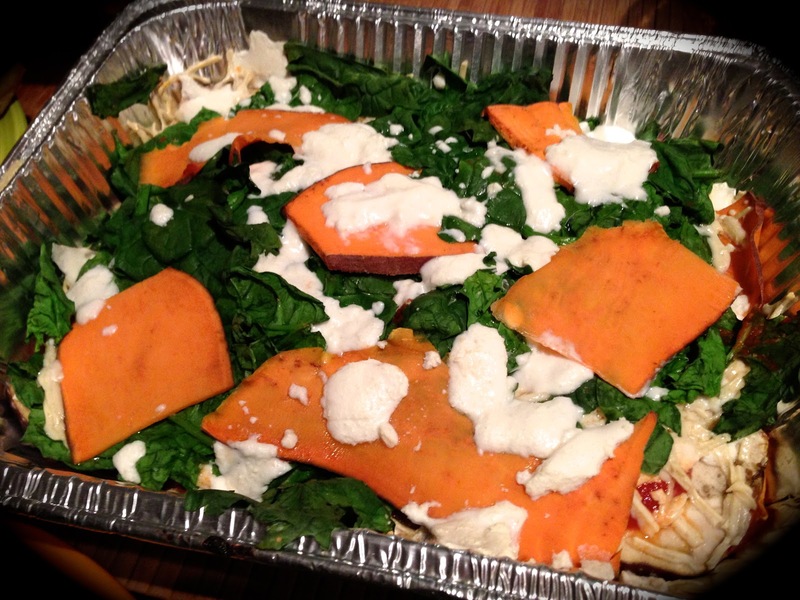 Ready to bake lasagna, bags of spinach and sweet potato puree to avoid having to bake the sweet potatoes first. For the record, I don’t boil any vegetables unless making a broth or soup. 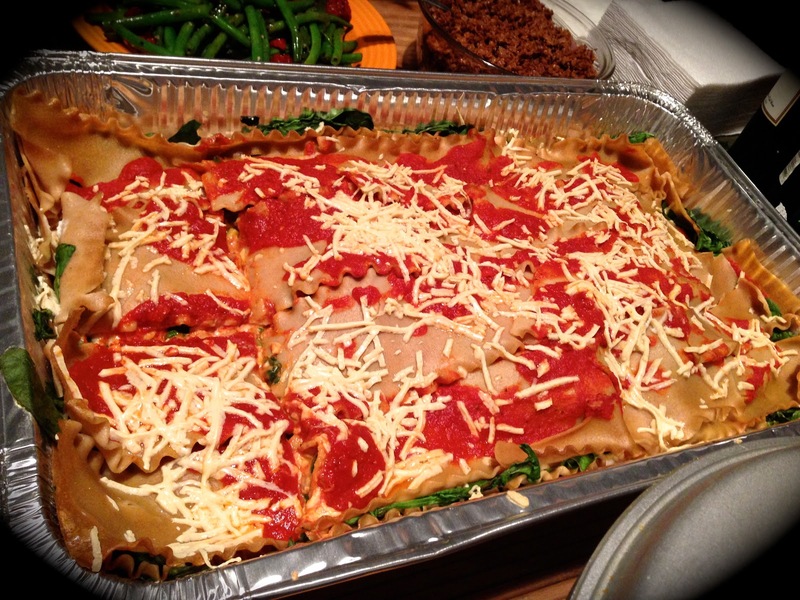 This lasagna is really for a party- not so much something I would eat every week- at all! Italian canned tomatoes, usually crushed but maybe one or two as puree. I like Tuttorossa and Sclafani. I use at least (4) 28oz cans. Always go more! (5) cans is good! I usually make 2 big trays. 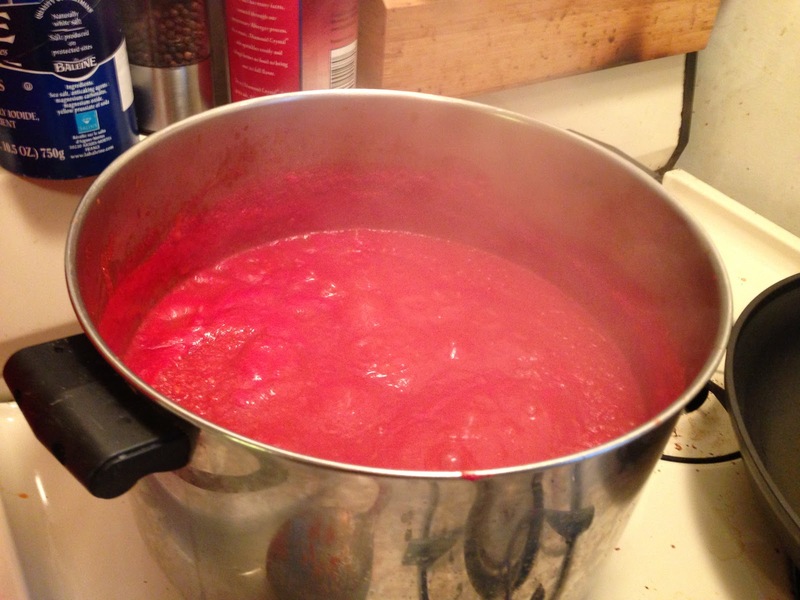 Tomato paste – the small cans. I use 1 or 2. Spices – salt, pepper, oregano, hot chili flakes if you can handle it etc. I start with an olive oil, onion and garlic sauté; then I add one can of paste and simmer. After a few minutes I add the sauce cans and water. Give it time. Add spices in too as you are taste testing. I used Boca soy crumbles. There are a few different brands so feel free to experiment. Boca makes PETA’s favorite vegan substitutes list. I used portabella mushrooms. Again.. experiment! Mushrooms are king in the health world. I am a spice girl! Well, not the London kind although I love them. I like my spices so I use them intensely here – bay leaf, basil, oregano, chili flakes, pepper, salt etc. I also began this sauté with olive oil, onions and garlic. First I put a little oil in the baking dish and a little sauce to prevent sticking. Then I placed in the bottom layer of pasta. I think I used about 1 1/2 boxes per tray. Again, buy more so you don’t have to run out later! Then I layered on the vegan meat. 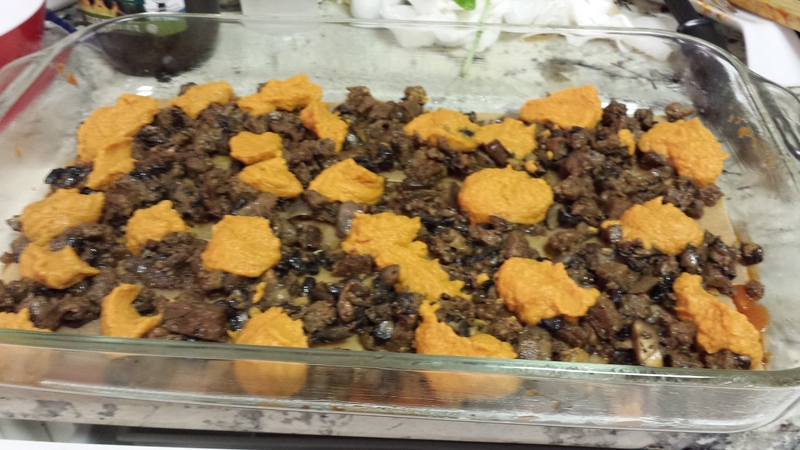 I added dollops of sweet potato puree. I’d say 1/2 to 3/4 can of organic sweet potato puree. 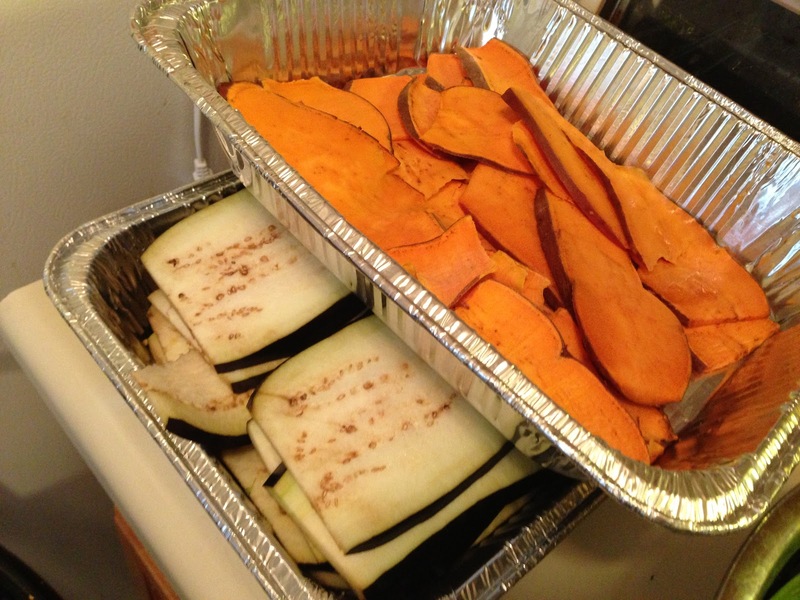 I have made it with thin slices of baked sweet potato but the puree melts in more perfectly. Trust me. 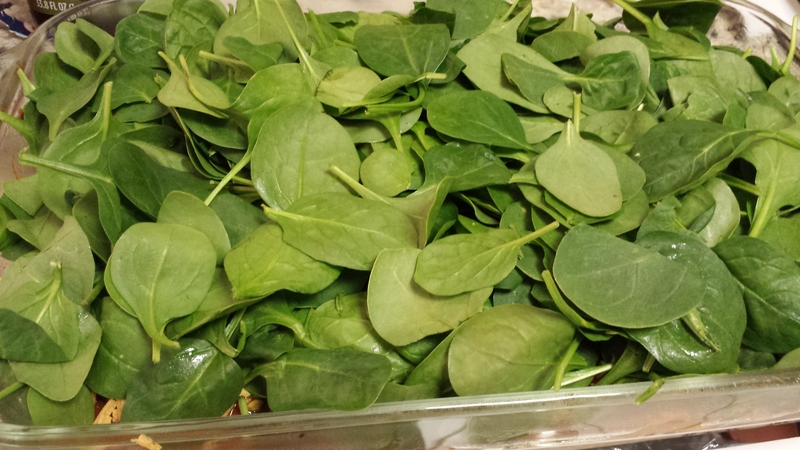 A heavy full layer of spinach. Press down gently. 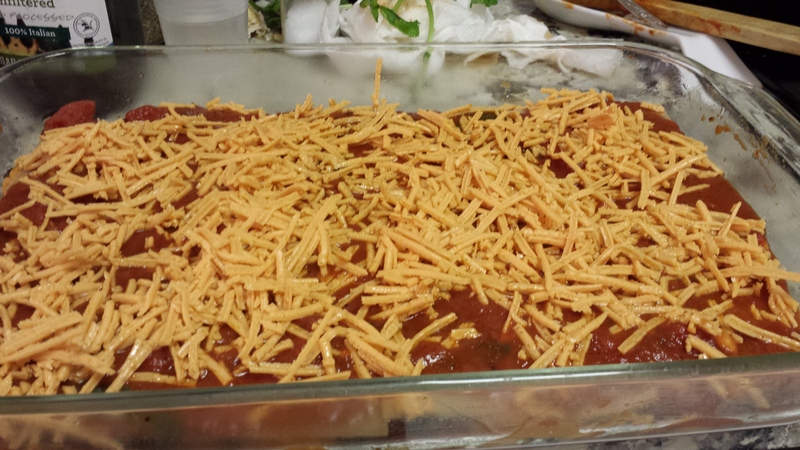 The top layer of pasta with sauce on top to cover it nicely and some Daiya cheese. Make sure you get sauce in all the corners too so it doesn’t dry out. Approximately 45 minutes baking time at 350 degrees. Be careful not to use too much salt with the vegan meat and sauce because the Boca and Daiya have salt too. Bake, set, cut, eat! Approximately 45 minutes baking time at 350 degrees. Be careful not to use too much salt with the vegan meat and sauce because the Boca and Daiya have salt too. I love making lasagna and have mastered it quite often and in all different ways- regular meat lasagna (yes before I went vegan), vegetarian lasagna, vegan lasagna, pasta-less lasagna and even raw lasagna! So I decided to have a mini vegan get together and I do not know what happened! I guess I got confused with all my lasagnas. I must have had my meat/ whole wheat lasagna hat on when I made my vegan pasta-less lasagna. Hence I cooked it too high and too long. I guess at this point you could call it lasagna soup. It was delicious none-the-less but not of too much substance nor of health for that matter. So- I did what any determined blogger would do. I made it again and invited more people over. This time.. lol.. I wore my pasta-less/ vegetable lasagna hat.. and didn’t cook it long enough. It was like reverse fear! Oh my God! Take me out of the world of pasta for three years and look what happens! This was easily rectified though. I cooked it longer and there is goes.. a beautiful (vegan) whole wheat vegetable lasagna with daiya cheese (vegan) and all! I of course, made a pasta-less vegan one on the side for me which finally came out good! The key was– longer times with the whole wheat pasta and shorter times for just vegetables. Also zucchini and squash create possibly too much liquid unless you cook them slightly before hand. When using other vegetables like eggplant or sweet potato – be sure to cut them thinly. Spinach and mushrooms also work great. First things first- you have to make a slamming sauce. This I have mastered from my Grama for sure.. and then my Mom and believe it or not.. my brother too is a great cook! I have ventured away from the meat infused recipes so it’s all about the olive oil, garlic, onions, spices, tomato sauces and letting it cook for a while! Next up is the pasta cooking. I know they make those ones that just bake in- but where do I find them in whole wheat? Since I do not know, I went ahead with boiling the whole wheat lasagna noodles. While that was cooking, I sliced my vegetables thin. The first time I used eggplant, zucchini and squash- the second: eggplant, spinach and sweet potato. I have a mandolin but I don’t like using it as I almost lost skin a few times. I admit- I must learn how to slice thiner! Where can you buy daiya cheese and vegan ricotta? Well, daiya is becoming more popular every day – it may even be in your local supermarket. I used the shredded mozzarella version. Vegan ricotta– lol- I wasn’t even sure it existed but it did! I found this at Whole Foods. I will admit though that it almost tasted like a vegan ice cream of some sort. 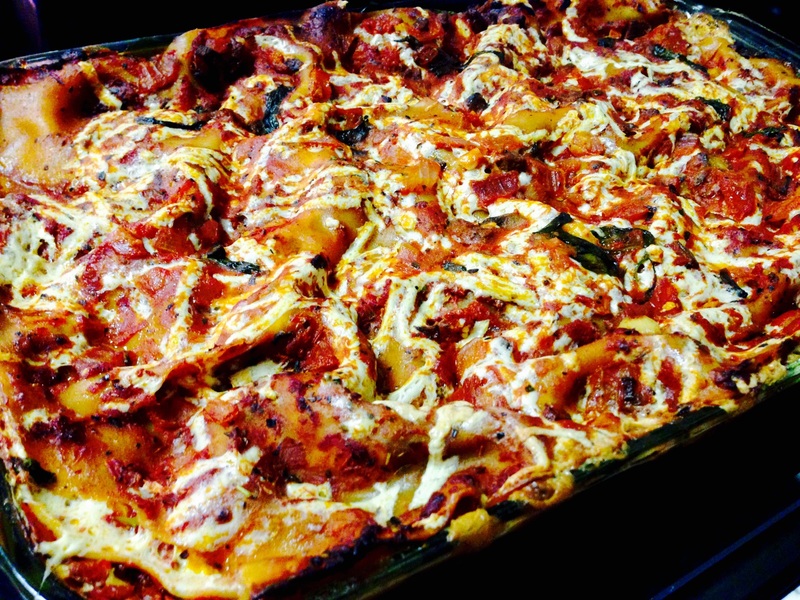 In any case, melted daiya is heavenly and can carry the whole lasagna! Layering is always fun. Just dive in with the pasta, the vegetables, the sauce and the vegan cheeses! Have fun and watch the lasagna for timing. It should obviously be not too soupy and not too tough! The final lasagna picture is up top. This one here is the pasta-less vegetable one that could have been layered a little better but was still remarkably delicious! Enjoy! 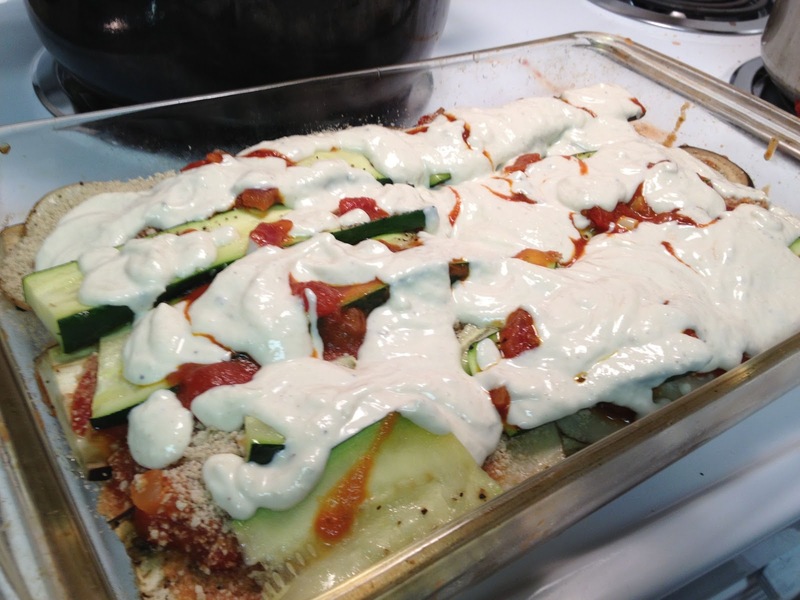 For the record, here is the raw lasagna recipe from an earlier blog. I love the memories of consistent home cooked meals with friends and family around. Growing up, this was more of a weekly event but later with my friends, I recall more of a monthly get together. What is especially on my mind is the times of hanging out with my Brazilian friends. One friend specifically, Janaina, did the cooking. Today she is a chef and it’s of no surprise to me. Her food was always amazing! I must have asked for the Bobó de Camarão so many times that I had no choice but to learn how to make it. 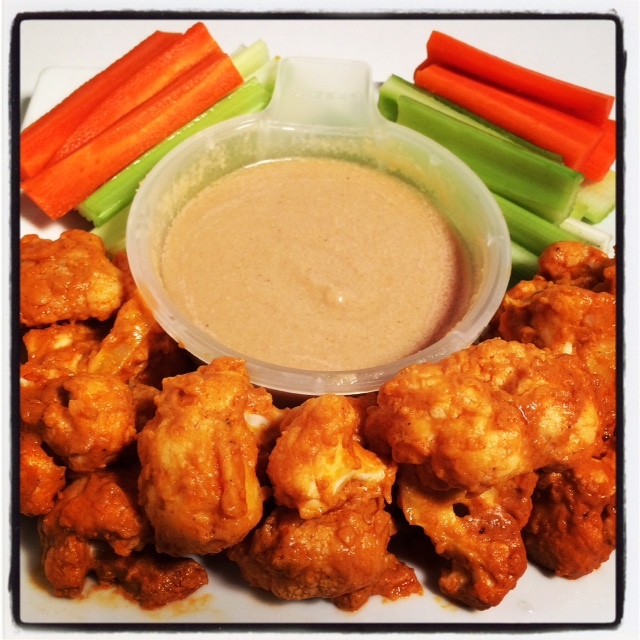 I guess you will have to ask her for the non-vegan secrets but for now, I will share the recipe as I veganized it! This was a dish that I made in December for a work holiday party. 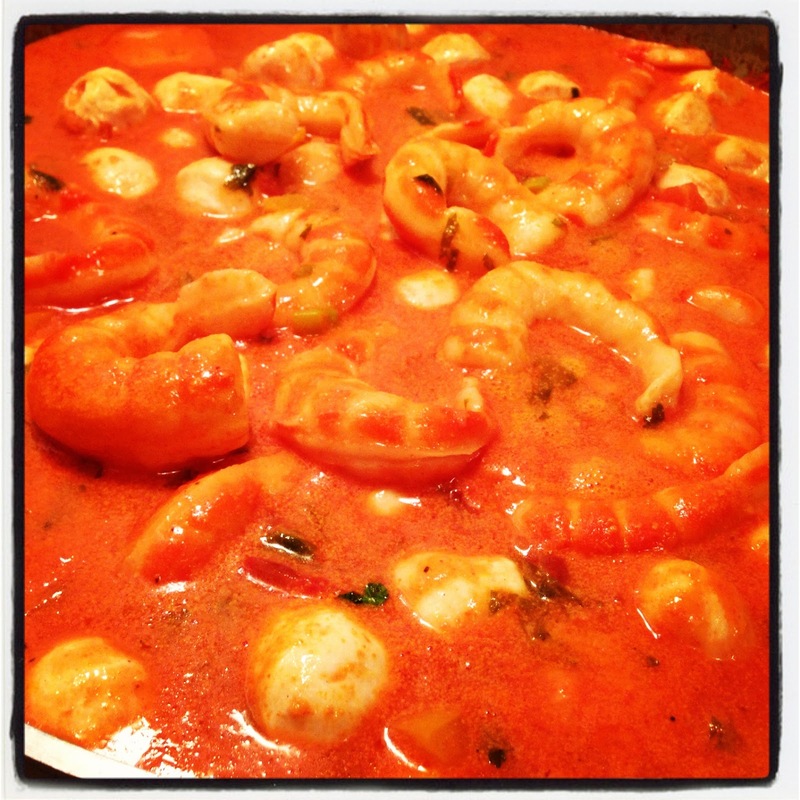 Bobó de Camarão is a delicious Brazilian dish made with shrimp and a beautiful puree involving coconut milk. 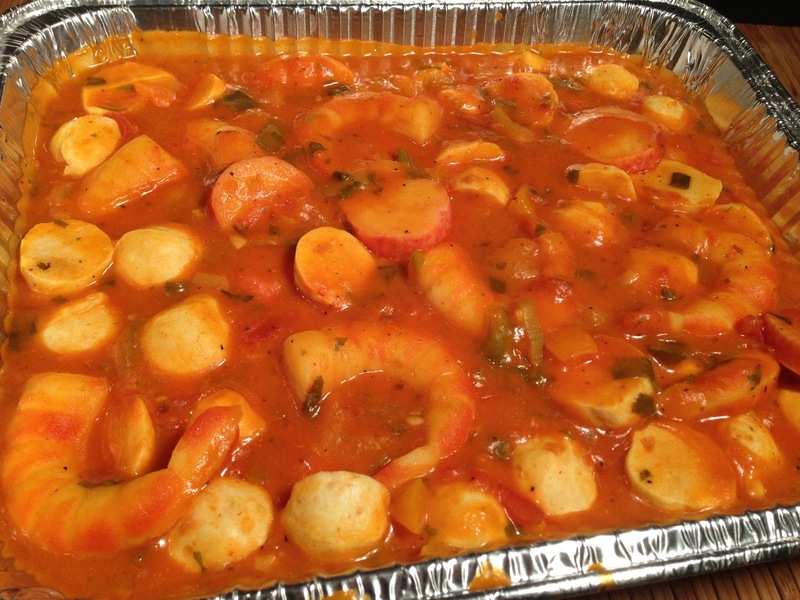 This dish is inspired from the region of Bahia, Brazil. There are probably a few different ways to make it and I’m confident that this way is up there among the best. 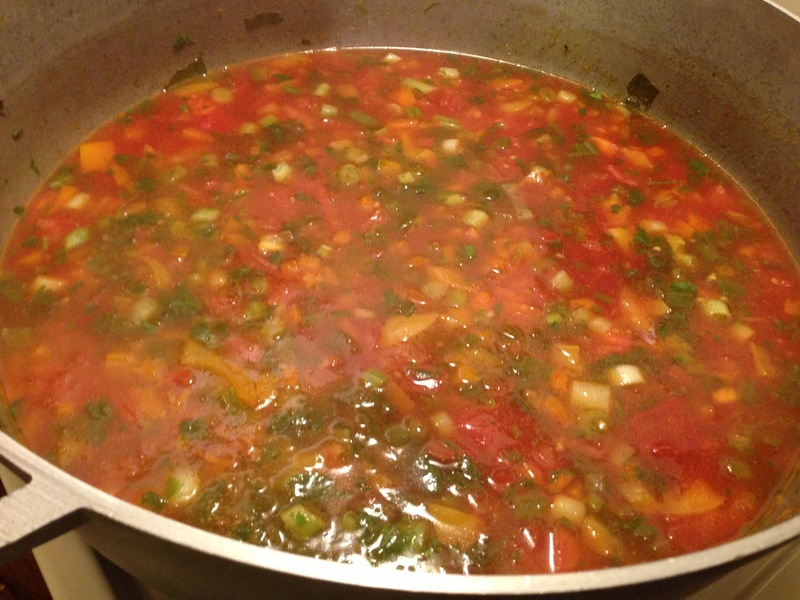 This is the recipe how I made it using an extra large pot! 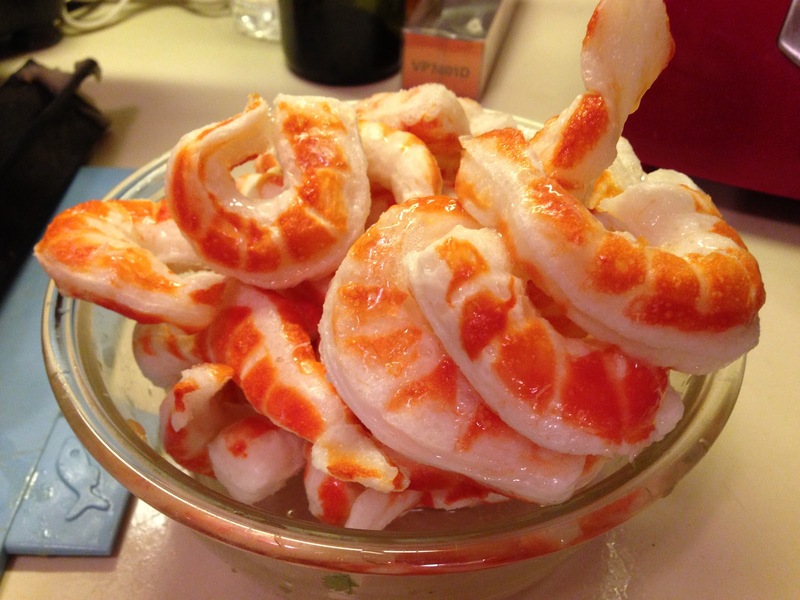 Shrimp– I used fake shrimp that actually resemble the real ones quite well except for the texture which may take a little getting used too. It’s vegan though! Sazon con Azafran– 1-2 packets. I hear they have MSG free ones! Begin with a sauté using the oil, garlic, onions and scallions. 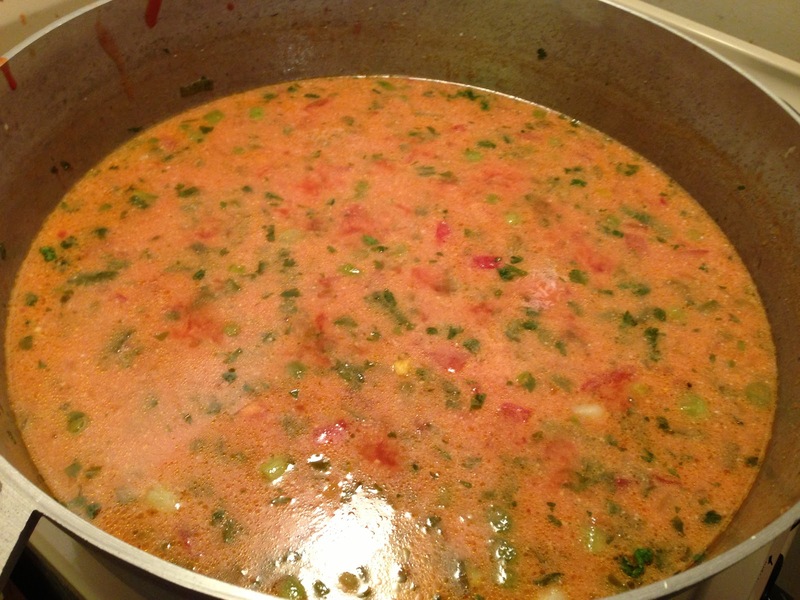 Next I use the canned tomato sauce. Later if I want it even thicker I may add a small can of paste. What’s interesting is watching the color and flavors of this puree as it changes and builds momentum. 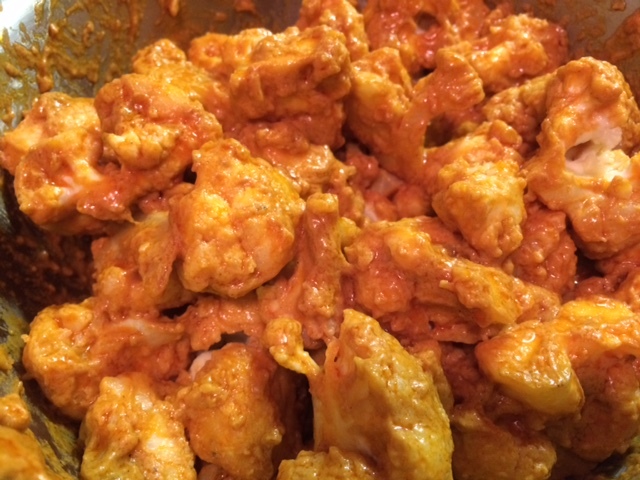 Once this has absorbed and cooked, I add in the coconut milk. I use between 1 and 2 cans depending on the flavor and how much I am making. The yucca I cooked first in a separate pot. I blend it in a good food processor- this is where I had a problem. The yucca burnt out my Montel Health Master and yes I am mad about it. I had to resort to my regular and smaller food processors. This was not easy. Perhaps I needed more liquid or perhaps I just needed a new high end processor like the Vitamix that I got for Christmas. In any case, I added this yucca to the mix but was not able to achieve the floating masterpiece that she so eloquently and deliciously makes. To recap the secrets: Work in steps, build the flavor, track down the Brazilian oil.. and then learn how to float the yucca on top like a dumpling! Have fun with it! Thank you Janaina for inspiring me how to cook and thanks for the final tip- I needed to add more of the actual puree to my yucca mixture in the blender. I guess it’s not Montel’s fault after all. Just kidding, I always take responsibility for my cooking errors no matter how many! This dish was such a hit with my family and friends that I promise right now- I WILL MAKE IT AGAIN for the holiday staff party lol. 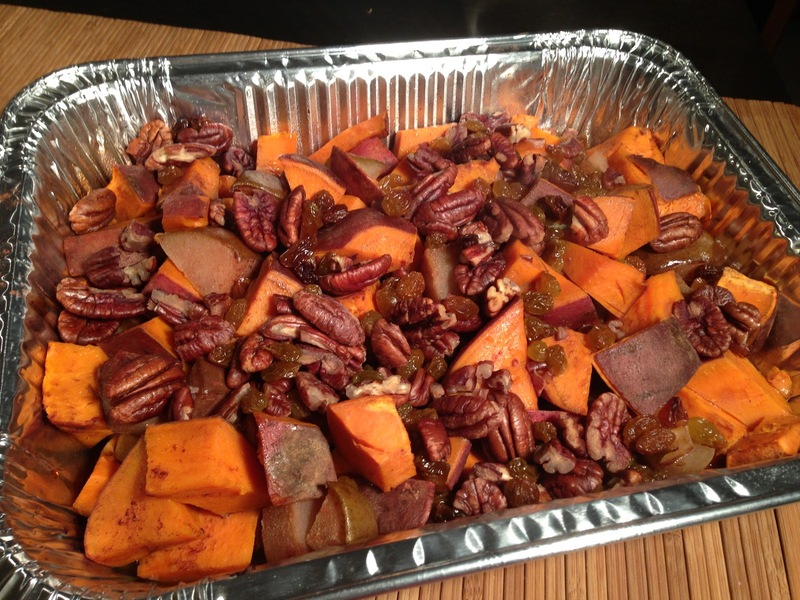 I happen to use yams for this recipe. I believe sweet potatoes will be even sweeter if you like that. Mirin – 2 tablespoons. 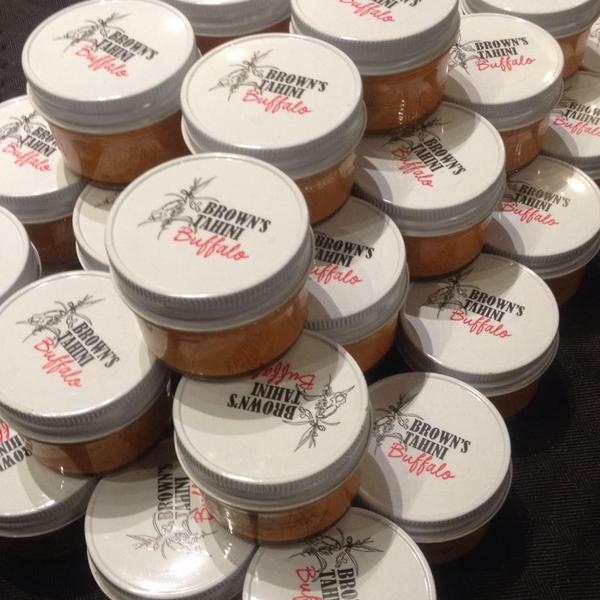 If you haven’t heard of this… it’s time to go buy some! I may have altered this recipe slightly due to my impatience to read all the way through. I cut the yams/ sweet potatoes into 1 inch cubes. I cut the pear into similar shaped pieces. Tossed everything into a party size baking tray. I poured the oil, mirin, maple syrup and cinnamon right on top. I didn’t really mix anything as I knew it would all melt around. I baked this for 30 minutes at 350. Then I mixed it gently to move the juice or sauce around. I added the pecans and raisins and baked another 30 minutes. VEGANOMICON is an amazing vegan cookbook that I was delighted to receive as a birthday gift not too long ago! My friend said.. “page 164.. MOUSSAKA”. First of all, I was impressed that a non-vegan friend of mine even opened the book! Then to say moussaka, ok.. you have my attention. I remember the last time I made moussaka and pastitsio and it was pretty intense. It’s basically the Greek version of an Italian’s lasagna. I have spoken of lasagna plenty of times- yes I consider myself a pro.. in a non-chef/ non-cook type of way. The Greek dishes were the same for me- planning, prep and execution! I love these types of dishes- perfect for parties and events. Now I had to veganize. I remember the last time making these but by no means the exact ingredients and they were far from vegan. I read through this recipe a few times and I was ready to tackle it. I am so happy that I started Veganomicon with this one and so proud that it came out delicious! This is really a wonderful dish to try and it was even more amazing that it was animal-free. This is the order I went in: vegetables, tomato sauce and then the pine nut cream. 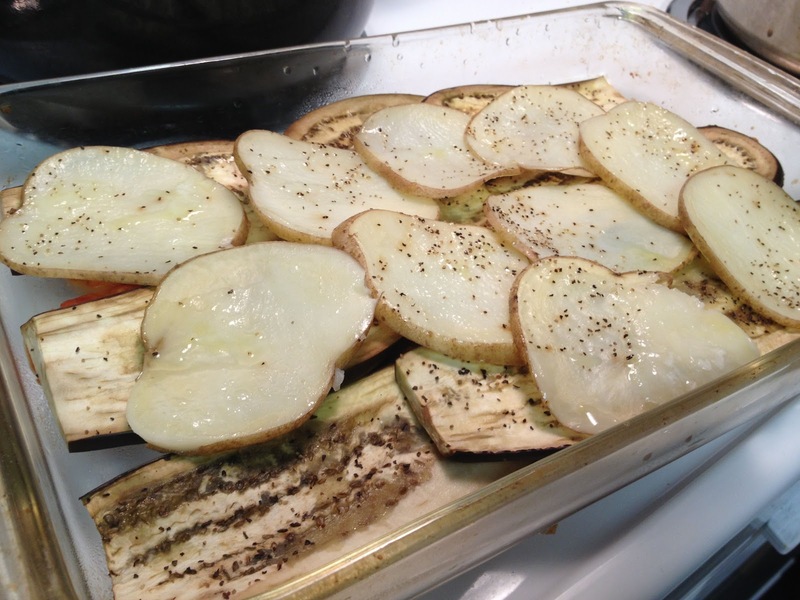 First thing was to cut, lightly oil and bake slices of potatoes, eggplant and zucchini. While these were cooking I started the tomato sauce and then prepared the pine nut cream sauce. The tomato sauce was basic. The pine nut cream flavor that I was trying to resemble was that of bechamel cream sauce. Interestingly enough, as I sit here and write, I find that the bechamel sauce is sometimes made with milk and flour. I knew it needed something creamier and now it makes sense. I wanted to add a nut milk but it was already on the thin side. 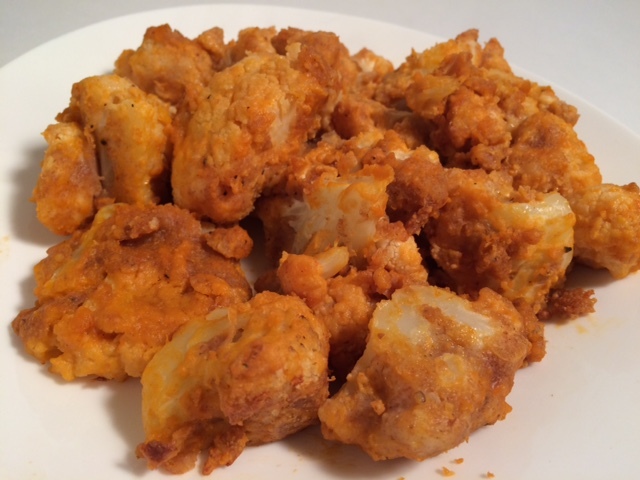 I knew to add a little brown rice flour that I had on hand to compensate for the arrowroot powder that I was missing. In retrospect, I could have added some nut milk and more flour then to thicken it. Live and learn. The nut cream was prepared in a food processor- no pre-cooking. After the vegetables were cooked for about 20 minutes, I began the layering. 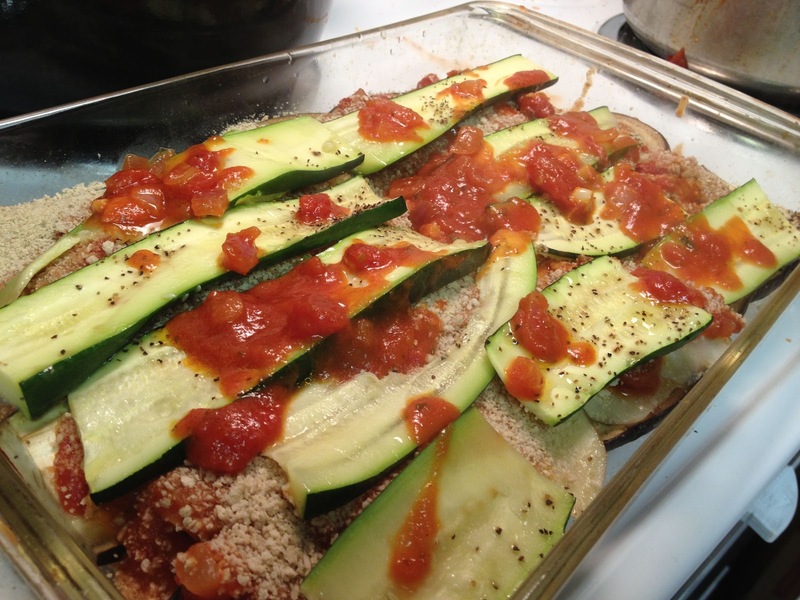 I greased a baking dish with olive oil and then layered in the eggplant, potatoes, then tomato sauce, zucchini, pine nut cheese and then topped it all with some extra whole pine nuts.